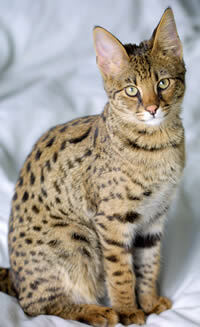 Savannah Cat - The Savannah is a hybrid domestic cat breed. It is a cross between the serval and a domestic cat. Savannahs are considered one of the larger breeds of domesticated cats. Their tall and slim build gives Savannahs the appearance of greater size than their actual weight. F1 and F2 hybrids are usually the largest, due to the stronger genetic influence of the African Serval ancestor. Male Savannahs tend to be larger than females. Because of the random factors in Savannah hybrid genetics, there can be significant variation in size, even in one litter. The coat of a Savannah depends a lot on the breed of cat used for the domestic cross. Early generations have some form of dark spotting on a lighter coat, and many breeders employ "wild" looking spotted breeds such as the Bengal and Egyptian Mau for the cross to help preserve these markings in later generations. 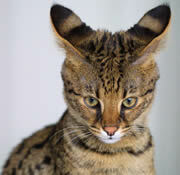 The overall look of an individual Savannah depends greatly on generation, with higher-percentage Savannah cats often having a more "wild" look. The domestic breed that is used will influence appearance as well. The domestic out-crosses for the Savannah breed that are permissible in The International Cat Association (TICA) are the Egyptian Mau, the Ocicat, the Oriental Shorthair, and the Domestic Shorthair. A Savannah's wild look is often due to the presence of many distinguishing Serval characteristics. Savannah cats are commonly compared to dogs in their loyalty, and they will follow their owners around the house like a canine. They can also be trained to walk on a leash like a dog, and even fetch. Owners of Savannahs say that they are very impressed with the intelligence of this breed of cat. An often noted trait of the Savannah is its jumping ability. Savannahs are very inquisitive, and have been known to get into all sorts of things. Vocally, Savannahs may either chirp like their Serval father, meow like their domestic mother, or do both, sometimes producing sounds which are a mixture of the two. Laws governing ownership of Savannah cats in the United States vary according to state. Most notably, hybrid cats "defined as a domestic/wild species cross" such as the Savannah are illegal to own as pets in the state of New York as of 2005. The majority of states, however, follow federal and United States Department of Agriculture code which define wild/domesticated hybrid crosses as domesticated. This information is licensed under the GNU Free Documentation License. It uses material from the Savannah Cat article on Wikipedia.org. 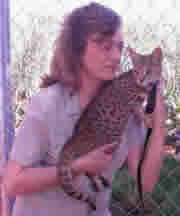 Savannah Cat Breeders - Advertise your cattery kittens and cats here. DonaMae Cattery - Arizona - DonaMae Cattery is a small family run cattery located in Phoenix, Arizona. Our cats are given regular attention and are loving and friendly. We strive to produce quality Bengal, Savannah and Ocicat kittens. Kittens are well handled by us to help socialize them toward humans. See our website at www.donamae.com, for savannah kittens that are occasionally available.Â Call 623-582-1015 to make an appointment to visit our cattery.Â We ship to major airports in the UnitedÂ States. Sadies Pets - Tennessee - We are a small cattery specializing in raising Bengal and Savannah kittens in our home. We do ship. SavannahCatz - New York - All kittens raised in our home with children. Well socialized and come with vet health certificate.